Brighton Ford : Everything St. Patrick’s Day! Happy St. Paddy’s Day to all of you lads and lass’! In the spirit of this fair holiday we wanted to share the history of St. Patrick’s Day, how people around the world celebrate, and the myths surrounding the holiday. Saint Patrick, who lived in the 5th Century, is the patron saint and national apostle of Ireland. Patrick was born in Roman Britain, but was kidnapped at the age of 16 and brought to Ireland as a slave. He escaped and later returned to Ireland and was credited with bringing Christianity to the people of the emerald isle. One of the most well known legends is that St. Patrick used the three leaves of the Irish clover, the shamrock, to explain the holy trinity (Father, Son, and Holy Spirit). Followers of St. Patrick adopted the custom of wearing a Shamrock on his feast day. St. Patrick was believed to have passed away on March 17, 461, which is why the holiday is celebrated on the 17th of March each year. The people of Ireland have been honoring the Roman Catholic feast day of St. Patrick’s Day since around the ninth or tenth century. Interesting enough, the first St. Patrick’s Day parade wasn’t held in Ireland, but here in the United States. On March 17, 1762, Irish soldiers who were serving in the English military marched through New York City. The parade helped the soldiers reconnect with their Irish roots, as well as with fellow Irishmen serving in the English army. We went to Discover Ireland.com and George Mason University’s History News Network to clear up some of the misconceptions about St. Patrick’s Day. Fact – It is true that there are no snakes in Ireland (except for the ones at the zoo) but the absence of snakes has little to do with St. Patrick and probably more to do with the fact that there have never been any indigenous snakes in Ireland. Driving the snakes from Ireland was most likely symbolic of putting an end to pagan practices, which disappeared from Ireland in the centuries after St. Patrick introduced the seeds of Christianity. Fact – Its seems that people wishing to become ‘Irish for the day’ have opted for the green of the Irish flag to express their “Irishness”. In fact, in the US, it’s not uncommon to spot folks sporting hand-drawn shamrocks on their cheeks with streaks of green running through their hair. The Irish didn’t always look so kindly on donning the color green. Irish folklore considered the color unlucky, as it was the favorite shade of the Good People – leprechauns. Those who wore too much of the color – especially children – could be stolen away. Some cynics may tell you there are no such things as leprechauns, but there are those who beg to differ. True believers will swear that if you take a stroll along a quiet country lane in Ireland, you can actually hear the mischievous leprechauns giggling by the side of the road. Stop right there, turn around slowly, and DROP that picture in your mind of the little guy on the Lucky Charms cereal box. That jolly little imp, and his counterparts on greeting cards, pub signs, and your Aunt Margaret’s stationery, bears almost no resemblance to the leprechauns of Irish mythology. To borrow a phrase from a long-dead philosopher writing about something entirely different, they were "nasty, brutish, and short." 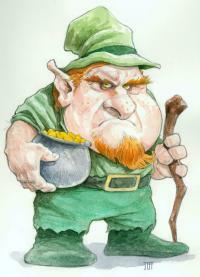 Leprechauns were grumpy, alcoholic, insufferable elves in the employ of Irish fairies. They made shoes for fairies (hence their depiction as cobblers) and guarded their treasure, which to the leprechauns’ eternal frustration was revealed occasionally to mortals by a rainbow. Somewhere in the course of the Irish American experience, the leprechaun took on the characteristics of the loveable, but ultimately contemptible, stage Irishman. Really? What sort of luck is it that brings about 1,000 years of invasion, colonization, exploitation, starvation and mass emigration? In truth, this term has a happier, if not altogether positive, American origin. During the gold and silver rush years in the second half of the 19th century, a number of the most famous and successful miners were of Irish and Irish American birth. For example, James Fair, James Flood, William O'Brien and John Mackay were collectively known as the "Silver Kings" after they hit the famed Comstock Lode. Over time this association of the Irish with mining fortunes led to the expression "luck of the Irish." Of course, it carried with it a certain tone of derision, as if to say, only by sheer luck, as opposed to brains, could these fools succeed. 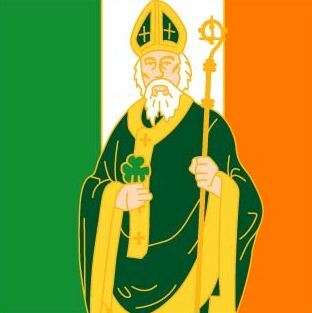 St. Patrick’s feast day has been celebrated been celebrated by the Irish in Europe since the 9th and 10th century. It is both a religious celebration and a celebration to showcase Irish culture by offering a national festival that ranks amongst all of the greatest celebrations in the world and promote excitement throughout Ireland via innovation, creativity, grassroots involvement, and marketing activity, as well as to provide the opportunity and motivation for people of Irish descent, (and those who sometimes wish they were Irish) to attend and join in the imaginative and expressive celebrations. The St. Patrick’s Day festival also aims to project, internationally, an accurate image of Ireland as a creative, professional and sophisticated country with wide appeal. Several major sporting events also take place including the Lenister Schools Rugby Senior Cup, The All-Ireland Club Football Championship, and the All-Ireland Hurling Club Championship. In the United States St. Paddy’s Day is celebrated by wearing green, attending festive parades and religious observances, and for those of the legal age – enjoying green beer. 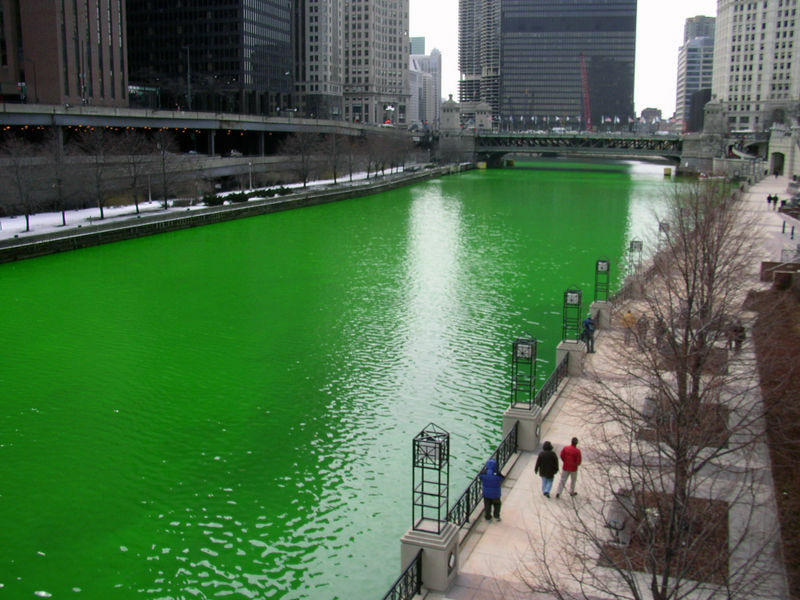 In Chicago each year the Chicago River is dyed green, a practice that started in 1962 when the city’s pollution control used dyes to detect illegal sewage discharges, after they quickly realized that it could be a unique way to celebrate the holiday. One of the longest-running Saint Patrick's Day parades in North America occurs each year in Montreal, the flag of which has a shamrock in one of its corners. The parades have been held in continuity since 1824. The Toronto Maple Leafs hockey team was known as the Toronto St. Patricks from 1919 to 1927, and wore green jerseys. In 1999, when the Maple Leafs played on Hockey Night in Canada on Saint Patrick's Day, they wore the green St. Patrick's day-themed retro uniforms. Parades are held in many cities throughout Japan each March in honor of the holiday. The first parade, in Tokyo, was organized by The Irish Network Japan (INJ) in 1992. Nowadays parades and other events related to Saint Patrick's Day spread across almost the entire month of March. March 17th is a day where everyone gets to be Irish and celebrate the culture. Have a Great St. Patrick’s Day this year! Have lots of fun, but remember to Be Safe! Wearing green is a great tradition on St. Paddy’s day, but how about driving around in something green? 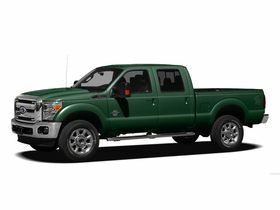 We’ve got green vehicles on our lot like this Ford F-350!